Greed – The Most Addicting Drug Out There! But I am human, I make mistakes, and sometimes I let my emotions get the best of me. These days, what’s causing me so much frustration? I’m sure in 2006, 2007, there were many real estate investors who also felt the same way… Oh wait, that’s right, I’ve met a few of them in meet ups before… Yeah, those same investors who got the most greedy at the end of the cycle and ended up filing for bankruptcy… That’s right, they did warn me about being careful and not ending up with so much debt that I risk losing EVERYTHING, like they did! But sadly, until the stock markets turn south for good, almost no one living inside Bubble Land will care at all! But that’s how the biggest financial mistakes are made! It’s really sad stuff… which is why I refuse to ever forget these life-changing moments… even if they weren’t my own personal experience. But one thing I learned during the last crash was this — No one will EVER ring the bell at the top of the market… A market crash never seems obvious until after the fact. I never wanted to get wiped out, or blindsided by greed. Yes, there are times that I stray too much and I get big-headed, thinking that I am a better investor than I really am… Hopefully when that happens, my friends, family, and even blog readers will be around to put me in my place! But for the most part, I’ve learned to be content with my gains… I made over $1,000,000 during the last cycle and was 100% content with checking out late last summer. I sold out of all my dividend stocks. I cashed out of all my index funds. I converted everything to cash and physical bullion (gold and silver). Despite all the capital gains and passive income, I knew that I had to draw the line in the sand somewhere… All good things come to an end, and winter always follows the fall which follows the summer. And if there is ever any doubt (like right now), look at things from a risk vs. reward perspective… Does the reward justify the risks involved? So why does this all matter? 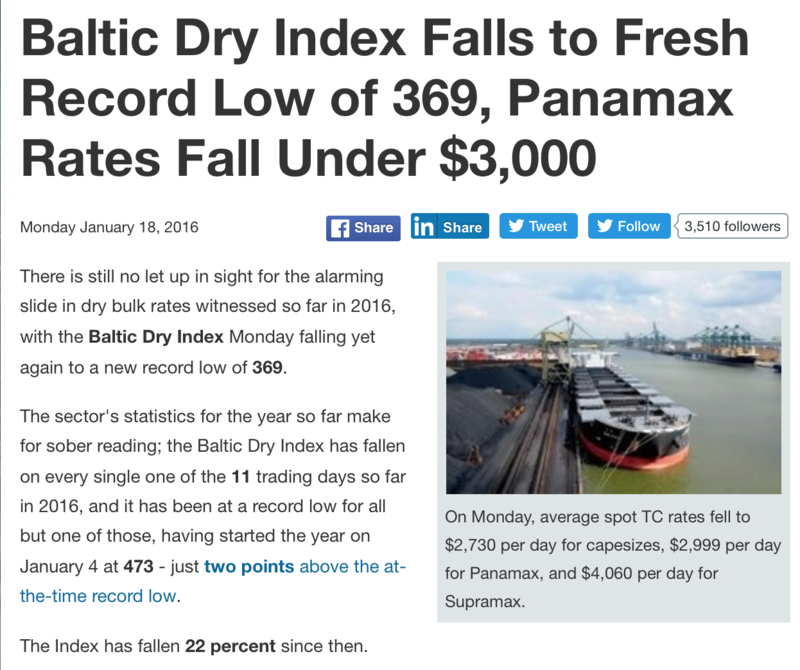 Well, the most recent time the Baltic Dry Index crashed was just before the 2008 global financial crisis, and many market-watchers say it predicted the crash. There are several other occasions when the index has pointed to a big correction in the global economy. The Baltic Dry Index has existed in its current state since 1985, and it had its first big drop in mid-1986, just under a year before the Black Monday crash hit markets in 1987. In 1999 the Baltic Dry slumped to 12-year lows, very soon before the dot-com bubble burst. It slumped again to another massive low in 2001, around the same time the US economy fell into a recession that lasted until 2003. 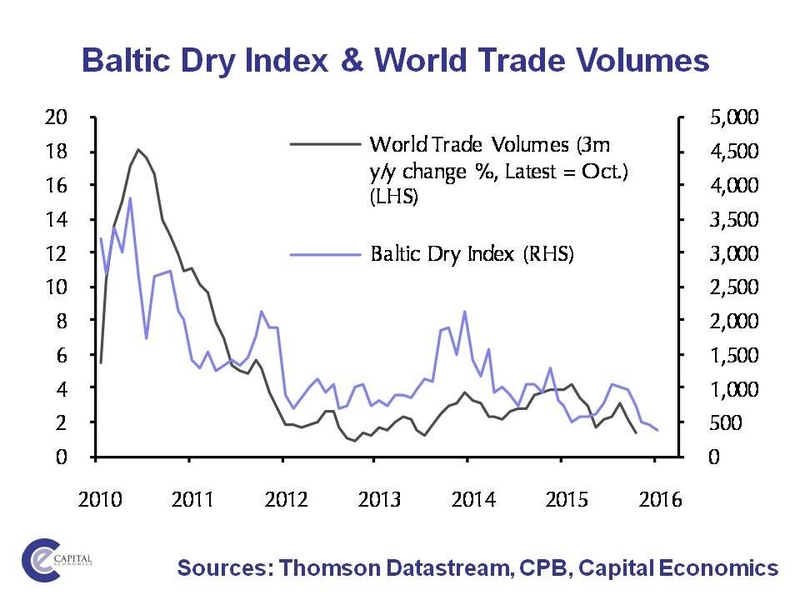 Of course, there’s skepticism over whether the Baltic Dry can actually predict global crashes, and no one is claiming that it is a perfect predictor of what the world’s markets will do. But other corners of the market are starting to ring alarm bells — William White, chairman of the OECD’s review committee and former chief economist of the Bank for International Settlements, suggested on Wednesday that the stresses in the financial system were “worse than it was in 2007,” and Goldman Sachs says a ballooning debt bubbling in Asia is creating the “third wave” of the financial crisis. The Bloomberg Commodity Index, a measure of returns from 22 raw materials. Three of America’s biggest banks warned last week that oil prices will continue to create headaches on Wall Street — especially if doomsday scenarios of $20 or even $10 oil play out. If oil stays around $30 a barrel, Citi is bracing for about $600 million of energy credit losses in the first half of 2016. Citi said that figure could double to $1.2 billion if oil dropped to $25 a barrel and stayed there. I mean you could of course buy right now, but if the markets then decide to massively sell off (this current sell-off is the conclusion of pregame warmups, at best), then what? And if you use up your ammo now, how can you buy for “pennies on the dollar” later (when the real wealth is made)? Sure, you might make a pretty penny, but hundreds of thousands of dollars? That seems highly unlikely at this point in time. So, I’m trying to be patient before I rush in to buy more Energy Fuels (UUUU), or Ivanhoe Mines (IVN.TO), etc. In the commodity space, I would say gold/silver are the only exception because they’ve already experienced a brutal 4-5 year bear market, and those assets have traditionally been used in the “Fear Trade” as real money to hedge against market calamities. In essence, gold/silver should be anti-correlated to the rest of the markets, even if that isn’t evident at this particular moment in time. I mean, you can’t really have a “glut” supply of “excess” gold… Gold is not heavily used in industry, and for centuries, all the above ground gold that’s ever been mined is STILL THERE… resting comfortably in bank vaults. So, when it comes to gold, I have no concerns with “oversupply”. When the oil majors fall 80%+ and see their dividends slashed (or suspended entirely), then we’ll start talking! So, I just can’t see the bargain in rushing out to load up on XOM, CVX, COP, etc. like most everyone else is doing… These investments (at today’s prices) won’t produce any life-changing gains for me, so really, why bother right now? Cash is king in a deflation! I’m practically financially independent now, as a consequence of being able to take advantage of a buying opportunity of a lifetime between 2009-2012. There will be a time to be a hero in this market… Just not now. I have been writing about the BDIY as well as transportation index and money supply base in the economy and how it affects the markets for sometime on my blog. Still you find a lot of people who believe the US economy is rosy and doing well. But we are not an island. If the world around us is crashing, commerce is basically halted (just check the Marine Traffic website), PMI is in recession, we are seeing deflation, GDP is slowing, all this points we are in recession. The markets have predictive ability so the recent drop is not just a “transitory” coincidence. We are heading into a trouble! 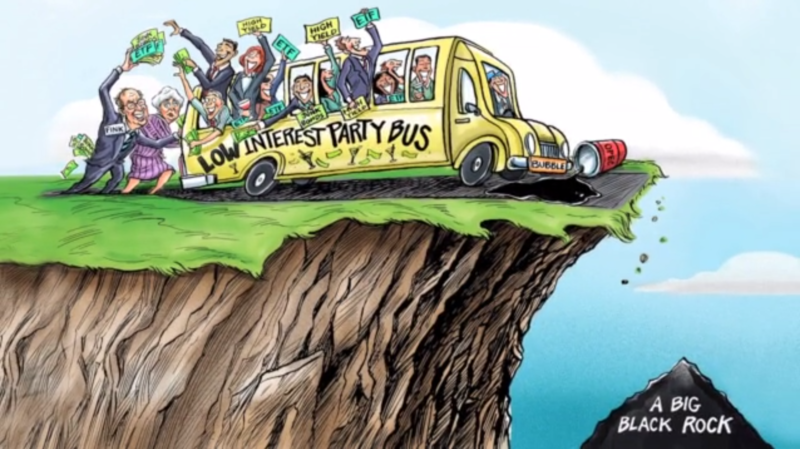 You really need a stock market crash to wake people up, unfortunately… Until that happens, many investors will keep pushing the envelope and taking out more stupid debt. Do you think perhaps the reason why you are so emotional is because the $1,000,000 in gains might not be real or liquid? You have been writing about financial freedom and quitting your job once you got to $1M net worth. Maybe that’s all it takes? Actually going through with freedom by leaving your job might finally put you at peace. I know change is scary, but sometimes you just got to make the move! Absolutely not. My frustrations are not about me… I did everything that I thought that I possibly could to prepare myself. I don’t care about my net worth being $1MM or not… That means nothing to me. I have the cash on hand. And my 8 rentals are for cash flow. From that perspective, I’m looking at things like every dividend investor does… Since 5 properties are in Class A locations, I sleep very well at night. The other 3 properties are out of state, cash flow well, and they were never overpriced (relatively) to begin with. And in those Midwest markets, housing is still cheap today… It’s not off in Bubble Land like Silicon Valley at all. As I mentioned in the article, my frustration and concerns have to do with my friends, co-workers, and other people. It’s not about me. I saw what happened last time around, and I would hate to have to witness that all over again. The average Joe always get screwed, no matter what. Quite frankly, I don’t need my job and I don’t care about that either. I’ve already amassed more cash flow/savings than I ever dreamed possible. I’m not long for the rat race, and those days are coming to an end soon. Are you sure your frustration is not with yourself? I’m just giving you the objective view that ever since you started investing and losing in gold stocks you’ve kinda gone off the deep end. You are an engineer and not a professional investor or gold industry veteran right? I understand it is scary to lose money, especially money you took more debt out to invest. It is also frustrating not to be able to leave your job now as planned. The key is to stop digging, as the markets can really upend people’s lives. Again, I’m just a long time reader, but I’ve gone through a couple full cycles now with real money, and no longer have to work. I understand the fear, anxiety, and frustration. Don’t forget about your mental health break you wrote you had to take a year and a half ago. Things could get really ugly where you not only lose your investment portfolio, but lose tenants, and the value of your property and have to work forever. Tighten things up financially! The first thing to recognize is that the “cash” you have investing is not cash but debt. Without admitting this, things could get very, very bad! Yes, positive. I know this is just the blog/internet, but if you knew me in real life you would know that I am not that me-centric of a person. Truth is, I don’t care that much about money in the first place!! I think you’re looking at this from a very money-centric point of view… To me, there’s just way more to life than just: money, money, money. And yes, I have a lot invested in mining stocks, but that’s not a part of my savings plan! As I mentioned in the article, I have over $120k in CASH. Ok, my fault for focusing on money, but isn’t this a money-related site? Is your $120,000 cash you saved, or cash you cashed out to take on more debt? What percentage of the $120,000 is from the cash out refinance? It is very hard to see what’s going on with oneself during turbulence. If you are OK with having to work longer at a job you said was really bringing you down, then that is all the matters. And since you say it’s not about money for you, then focus on lifestyle. The biggest lifestyle improvement is NOT working at a job that is making you sick. So the final question is, why are you staying? 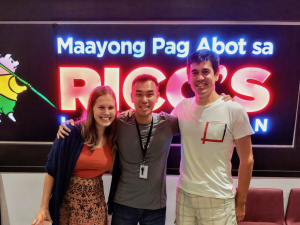 I know I’ve focused on money a lot, but no, this blog to me is not about money… Money was just the starting point to get to early FI/pretirement…. There is way more than that, and I’m going to get there soon enough. Can’t wait to start sharing those stories! I am leaving sooner than you might realize… There’s a plan that I have never discussed on this blog before. Sam, truth is, I’m in a very good place. I’m happy. If the JPMorgan CFOs biggest source of stress is $750m of losses over the next 18 months due to low energy prices, then I’d say that’s a pretty bullish indicator? Their earnings are around 20bn annually. The reason I brought that up was about the “bad debt” that still hasn’t come home to roost. That is the focal point, not so much about the impacts on Wells Fargo, or Chase, or Citi. The big banks will be fine. They are stress tested to endure these “minuscule” shocks. Oil ain’t seen nothing yet, but I’m not saying things in that space will necessarily get as bad either. I am still in the stock market, for a double comma amount. I am relying on 130+ years of history. It may be different this time, but likely not any worse than the great depression, great recession, stagflation, WWI/II or a whole host of other world events. Who knows what will happen this time. I suspect, as most advisers do, that regular investments over time, will still prove to be a winning strategy. Obviously, you have the staying power/timeframe to wait for things to recover back… It really depends on your timeframe and strategy. For me, I wanted out “near the top”… And I don’t want to buy back in until “near the bottom”. Market timing, which is probably the most unpopular approach throughout the entire blogosphere (as it pertains to early FI). I am with you in the mining trade, and I think the best thing that can happen for us is the market trundles along flat for the next few years, giving the capital cycles time to play themselves out. A massive crash wouldn’t be good for the mining stocks, just as it wasn’t in 08. Yes, in a market selloff, there’s a mad rush for liquidity and every sector gets sold off… When fear sets in, it’s not about undervaluation or bargains, it’s about getting the hell out of the system and meeting margin calls. So, of course you can try to time the exact bottom on when to jump in… That’s why having cash on hand is important. I’m terrible with market timing, so I hold: lots of cash, gold, gold mining stocks, rental properties for cash flow. That’s my strategy, but we’ll see how things work out. One of the reasons why I really like your blog is you are not afraid to think outside of the box and go against the herd mentality. As I have always said, if the herd mentality works then why are most people not FI. Buy and hold investors had a nice 5 to 6 year run. Now reality is setting in. Equities can’t just go up forever. I think it is completely reasonable right now to be defensive and risk averse if one has built a sizable nest egg that they want to preserve. I certainly understand your perspective particularly since you reside in the red hot bay area market. When the numbers in real estate do not make sense anymore, then history is repeating itself. For the typical person just looking to buy a home, I can see the conundrum. Rents keep going higher and you would rather own something and do not want to miss out. But rents are year to year and are subject to change. Committing to a long term mortgage on a property that would not breakeven from a rental perspective is risky. My market is completely different from the Bay area. Prices have not increased much since 2012. They are flat. So investing in real estate is still a very viable option in my market especially considering the low interest rates available. The problem is eventually you run out of capital. And one has to decide how much they really want to own. I would rather have a manageable amount of rental units that I manage very well then too many rentals that I do not manage as well. Because you can only do so much and I would rather be happy with a lot of personal time then miserable with a ton of rental units just to have more cash flow. If your monthly nut is already taken care of, then it is just greed. I am trying to focus more on personal happiness. After I acquired my last rental in 2015, I reached a state of complete contentment. In fact, if I never purchase another property in the future, I’m totally fine with that. I’m looking forward to the next stages in life… Soon in fact, I will leave behind all thoughts of $$$. Thanks Jon! Will do my best to keep at it. Have you ever put any thought into how to play the BDI? I’ve been doing some research into this and it seems like a very interesting opportunity.